When I first made this French toast, my friend was staying with me and I wanted to add a touch of indulgence to our otherwise lazy weekend. 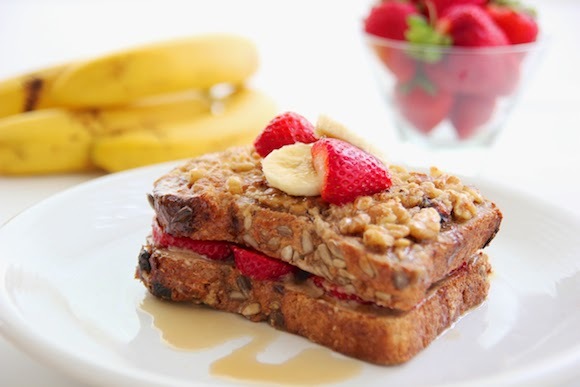 And what could be more indulgent than a stuffed French toast, smothered with a thick layer of almond butter, topped with layers of fresh strawberries and banana, and coated with a crunchy walnut crust? The answer is quite simply nothing. This classic breakfast fare is elevated to another level, turning it into something decadently gourmet, yet also rather healthy. Mangoes also work nicely in this recipe, if not better (but I’m slightly biased towards all things mango). Add a little indulgence to your next weekend brunch and your palate will surely be pampered. 1. Add walnuts in a food processor and pulse to a coarse grind. Spread the walnuts on a large plate and set aside. 2. In a large shallow bowl whisk together eggs, milk, vanilla, cinnamon and maple syrup. 3. 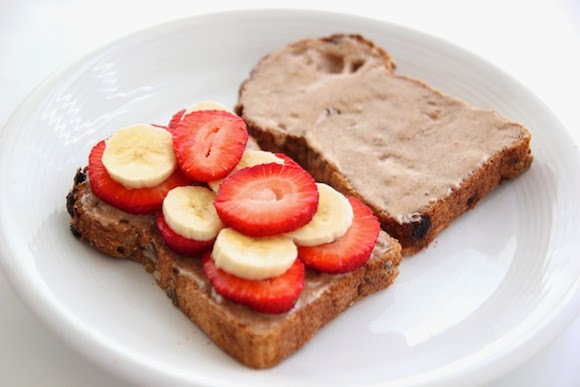 Spread a layer of almond butter on each slice of bread. 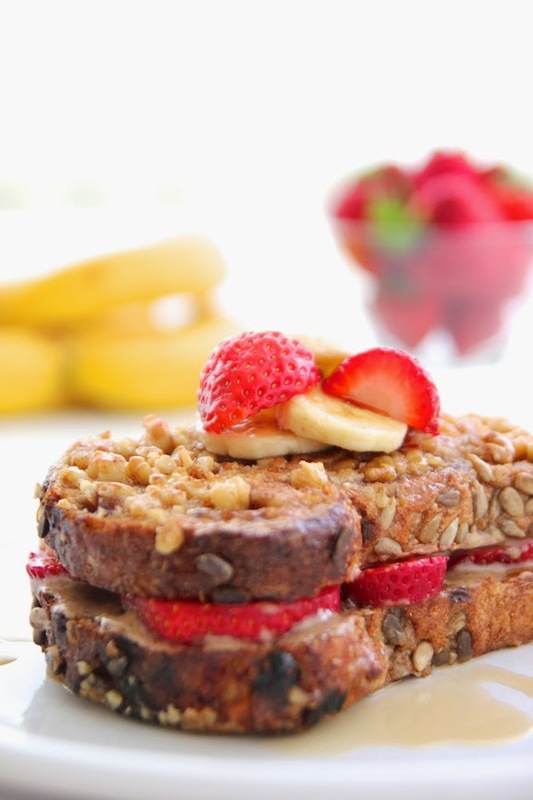 Arrange the sliced strawberries and bananas on top of the buttered side. Place the second slice, buttered side down, on top and press down firmly. 4. Gently dredge the stuffed toast in the egg mixture, coating both sides evenly. Remove the toast, letting the excess mixture drip off. Then dredge both sides in the ground walnuts. 5. Heat a nonstick pan or griddle on medium heat and lightly oil or butter the pan. When hot, place the toast on the pan and cook for a few minutes until golden brown. Flip over and cook for another few minutes. 6. Serve with a nice drizzle of maple syrup on top. This looks insane!! 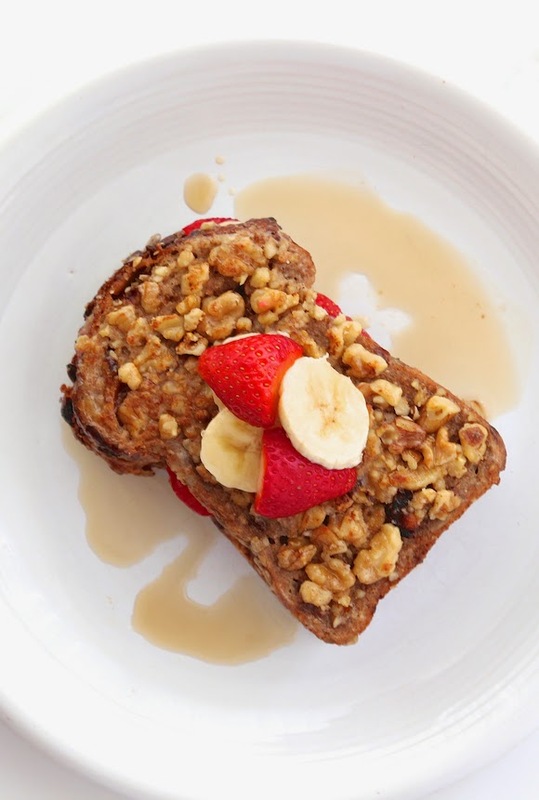 I am obsessed with almond butter, so I'll be trying this asap! UM, YES! This looks so, so good!